INTERSOLAR, the largest industry fair for solar energy, will open its doors on 15th of May 2019 in Munich. On the same day, European power market consultancy enervis and the international law firm Bird & Bird with its specialists in Rome and Milan will present their new outlook on the Italian power and renewables market. Italy has favourable conditions for a rapid growth of renewable capacity that will be realized both via tenders and PPA-backed merchant investments. At the moment this development focuses merely on utility-scale PV projects, but also wind energy is at the verge of market parity. Where will this development lead in future and what needs to be considered when planning and investing in Italian RES projects with PPAs or tenders? 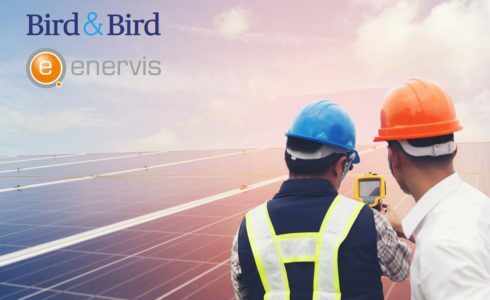 enervis and Bird & Bird have joined forces to answer these questions. Join us for a free evening event in Munich to learn more about the key findings on trends and outlooks on green PPAs, power market developments and renewable capture prices within our Italian Power Market Outlook 2019 – 2050. Please use our registration form below. With the study “Italian Power Market Outlook 2019 – 2050” enervis and Bird & Bird provide investors, project developers, banks and utilities with a comprehensive and quantitative basis for evaluation of activities in the Italian power market, especially for merchant renewables and green PPAs. The study covers a long-term view up to the year 2050. It contains comprehensive information on the current legal and regulatory framework of the Italian power market, merely focusing on renewable PPAs. In addition, the study provides a long-term scenario forecast of future power prices and capture prices for PV and wind in Italy up to the year 2050. The study combines the expert knowledge of Bird&Bird lawyers from Milan and Rome regarding the current Italian regulatory framework and its abundant PPA market experience with the long-established power market modelling expertise of enervis. Please inform me about current and future events and news from enervis. We require the data you provide for processing your registration. Of course, we handle your data confidentially. You can find more about the handling of personal data and information about your rights in our data policy.